field of quantum computation and communication . a completely positive (CP), trace preserving map [4-8]. history of the system i.e. memory effects are negligible. ment are in an initially quantum correlated state [13-16]. A. R. U. DEVI ET AL. ovian/non-Markovian nature of open system evolution. 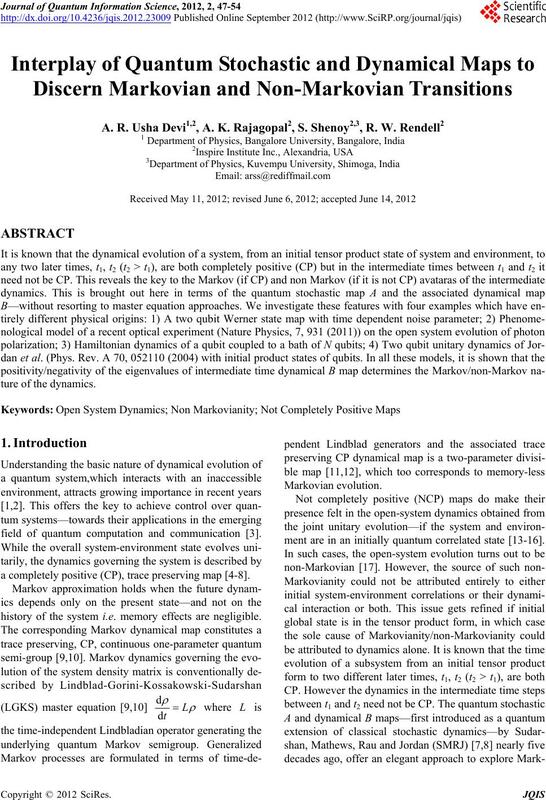 system evolution, is established in this paper. dynamics in terms of intermediate time A and B maps. some basic concepts [7,8] on A and B maps are given. under open system dynamics is discussed in Section 3.
gives an explicit matrix representation for the B-map. in the second line of Equation (10)). 1 the system and environment may get correlated (i.e. map). This is not based on any Hamiltonian underpinning. nature as one of the eigenvalues i.e. and back with the passage of time for different values of N.
merely in the intermediate time interval). process from Markovian to non-Markovian. ate times, revealing Markovian/non-Markovian regimes. 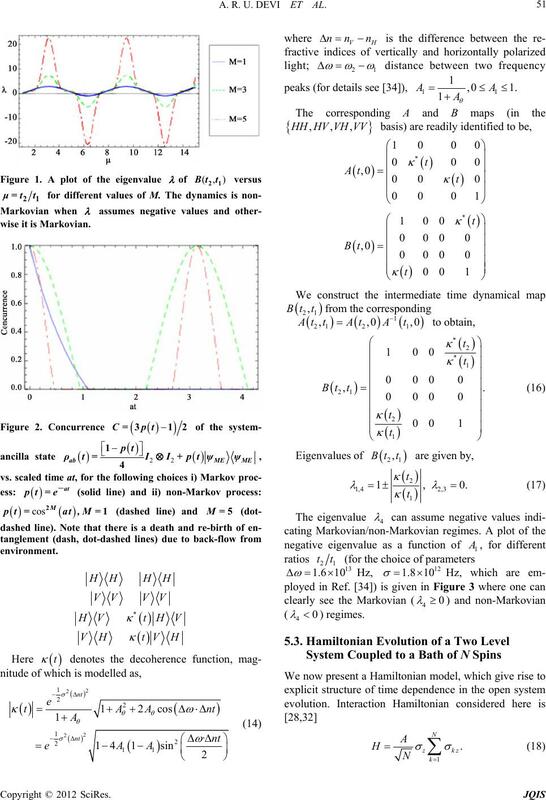 Groups and Applications,” Springer, Berlin, 1987.
plex Matrices,” Linear Algebra and Its Applications, Vol. 10, No. 3, 1975, pp. 285-290. 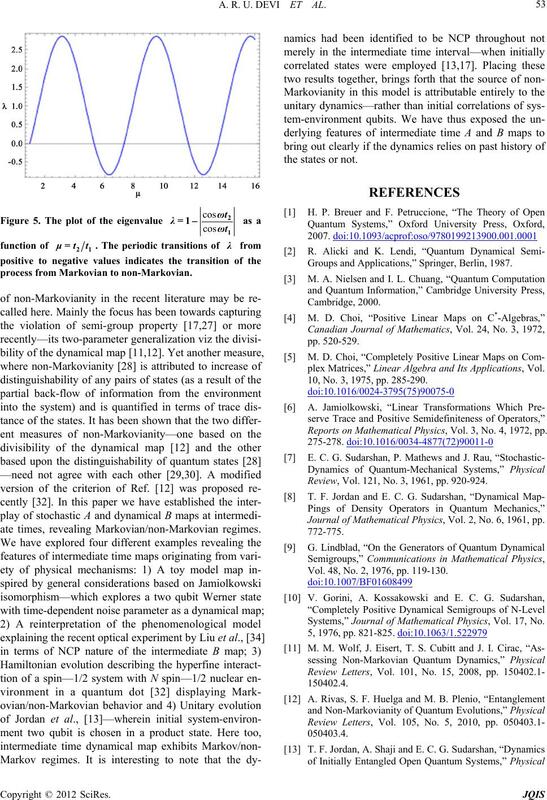 Reports on Mathematical Physics, Vol. 3, No. 4, 1972, pp. Review, Vol. 121, No. 3, 1961, pp. 920-924. 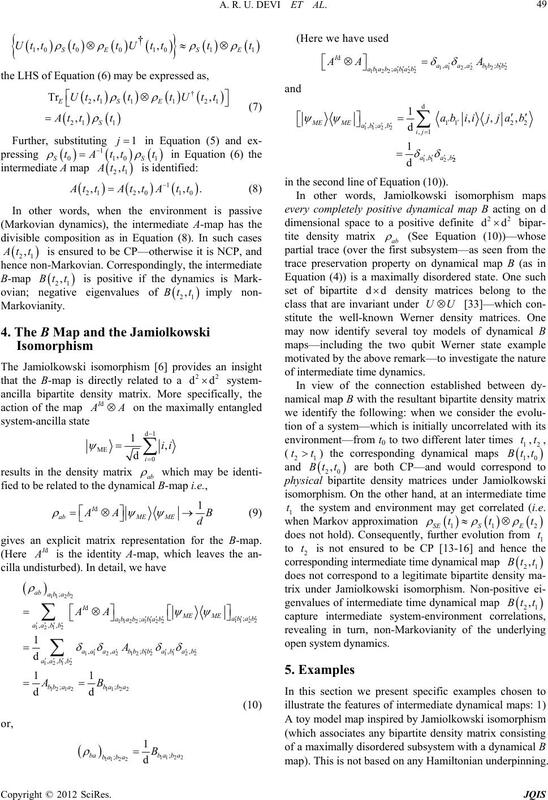 Journal of Mathematical Physics, Vol. 2, No. 6, 1961, pp. Vol. 48, No. 2, 1976, pp. 119-130. 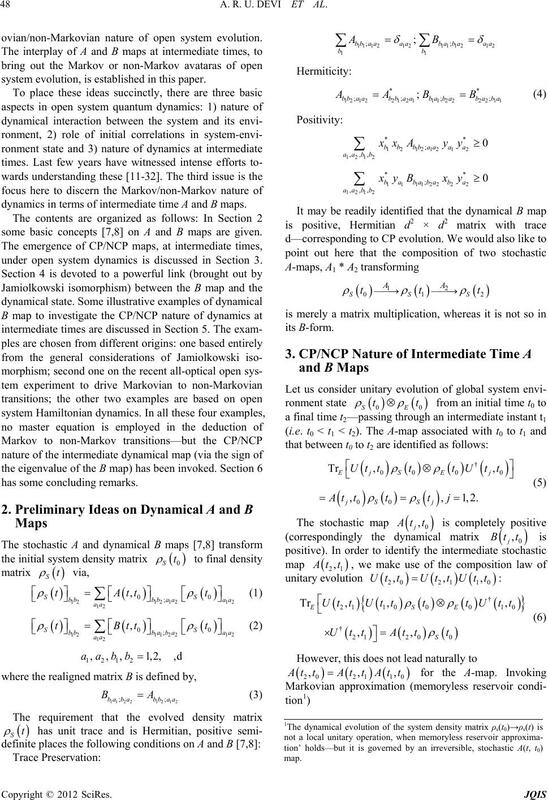 Systems,” Journal of Mathematical Physics, Vol. 17, No. Review A, Vol. 70, No. 5, 2004, pp. 052110.1-052110.14. American Physical Society, Vol. 53, No. 2, 2008. 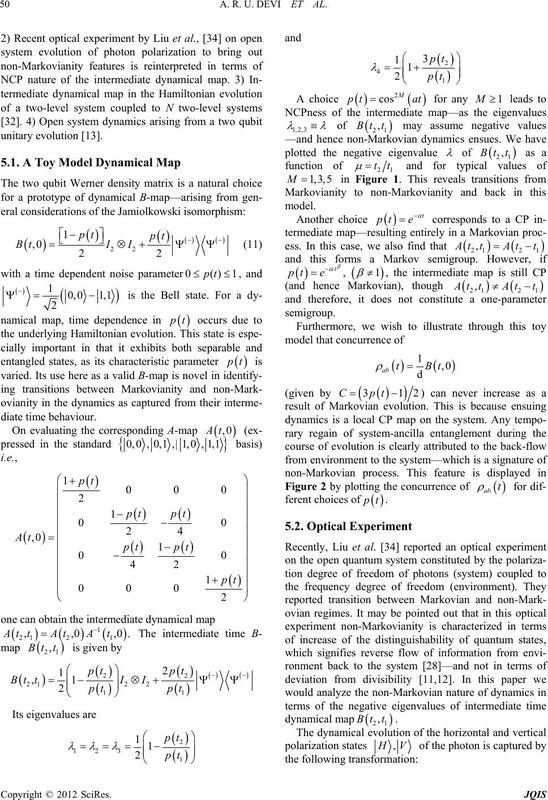 Classical Correlations,” Journal of Physics A, Vol. 41, No. Quantum Process Tomography,” Physical Review A, Vol. 81, No. 5, 2010, pp. 052119.1-052119.10. Vol. 69, No. 2, 2004, pp. 022115.1-022115.8.
nel,” Physical Review E, Vol. 79, No. 4, 2009, pp. tems and Information Dynamics, Vol. 14, No. 3, 2007, pp. Forms,” Physical Review A, Vol. 82, No. 4, 2010, pp. 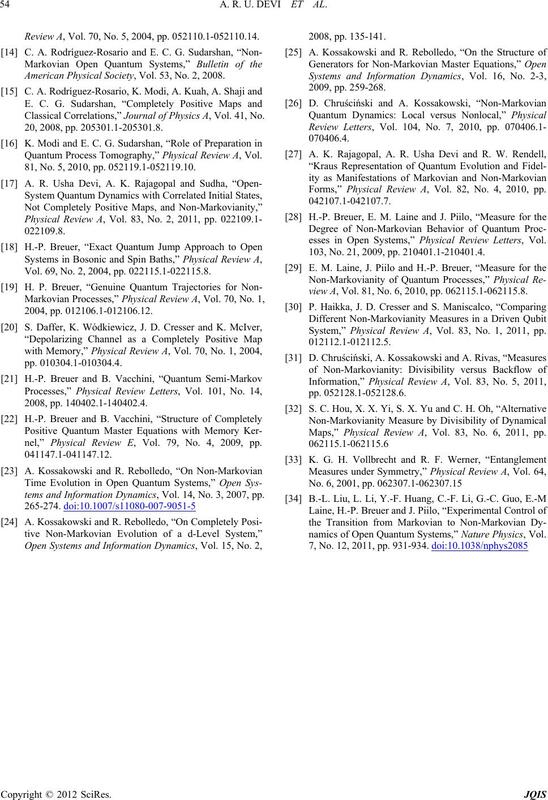 esses in Open Systems,” Physical Review Letters, Vol. 103, No. 21, 2009, pp. 210401.1-210401.4.
view A, Vol. 81, No. 6, 2010, pp. 062115.1-062115.8. System,” Physical Review A, Vol. 83, No. 1, 2011, pp. Maps,” Physical Review A, Vol. 83, No. 6, 2011, pp. 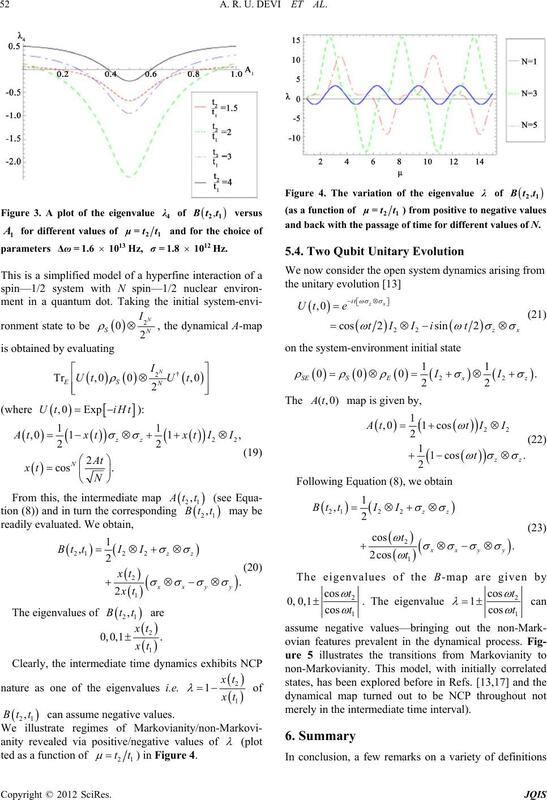 namics of Open Quantum Systems,” Nature Physics, Vol.